Dexter Ferry is a seedsman of merit as well (http://www.saveseeds.org/biography/ferry/index.html) . . . many releases under his belt, but for the pioneering work Livingston did with tomatoes, he is recognized as the father of the modern tomato industry. Very likely a huge number of them! But this is not a new phenomenon. As Carolyn has already described, seed companies got very competitive, some downright shady, and seemed to have no remorse for taking a variety, renaming it with their own monkier, and marketing it. This led to tons of confusion in the marketplace. Some companies, like Livingston, tried to curb what we would now call "theft of intellectual property" by using the trademark system in the U.S. (Patenting of life and PVP protections were a century away). If you look through old seed catalogs, you will see many merchants selling 'Beauty', for example. But you could only purchase Livingston's True Blue® brand 'Beauty' from Livingston. This confusion in the marketplace eventually led to the Federal Seed Act and renaming of cultivars became illegal. Did it stop the problem? Of course not. It still is a problem. Back in the 1930s, there was a lot of work going on at Cornell trying to address this issue. I refer to the "Vegetables of New York" series. The effort was taken to grow out everything available for comparison and to determine what varieties were synonymous. Sadly, economic times and war killed funding and the series was never completed. As far as the mess that exists today . . . It is a sore point with me. I manage a tomato variety database at another website (I am not sure if I am allowed to mention other resources here. If someone can clarify, I will post a link.) It seems that everyone and their dog has become a tomato "breeder" and the flood of "new" varieties is not slowing. Sadly, many are being renamed, invented, are unstable hybrids, and usually not possessing any unique attributes warranting "introduction" of yet another variety other than to stroke the ego of the person responsible. I have even read threads here at Tomatoville in the past where a person will find some unlabeled seeds in their closet, not know what they are, and instead of throwing them away as the rational person would do, they give them a name and distribute them. And a duplicate of some existing variety is born! Thankfully, I don't get caught up in any of that mess professionally as we focus on maintaining old, established varieties. For the most part anyway. We also do get interesting finds, real family heirlooms, from reputable sources like Andrey, Carolyn, Craig, Randy, etc. But again, they fall into the category of interesting and unique and worthy of preservation. Stepping off of my soapbox, I will get back to work. Last edited by stevenkh1; July 6, 2015 at 01:29 AM. Reason: My rambling does not make good dialog! I found out, that Acme was sold in 1881 by the German seed-company Ernst Benary, Erfurt. The Acme tomatoe was described as "neue amerikanische, glatt, violetfrüchtig, sehr fein”. That's the same like the description of Livingston himself. There was an other seed company also stayed in Erfurt, called Haage & Schmidt. This company startet selling "Liebesapfel Acme" in the year 1893 until 1907. Liebesapfel was an old german word for tomato. And last but not least, the donator of Acme Seeds LYC 1333 and LYC 291 was an German institution near by Erfurt. So may be, LYC 291 will be the right Acme tomato? And have you read this entire thread, especially the posts by Mike,who is the expert on Livingston varieties. The issue of what was discovered in Germany was also discussed, especially in post # 49. This thread was started with the confusion about what the REAL Acme was/is, and it turns out there is No REAL/TRUE Acme since Livingston himself wasn't sure, and different seed companies back then changed the names of already known varieties to indicate they had something new.And this concept of changing variety names was also discussed here,one of the last posts before you posted. I hope what I wrote helps,at least a little bit. thank you for your posting, too. Well, I have read the thread. But: Livingston released Acme in 1875. And the German Company Ernst Benary sold the seeds in 1881 as a new variety of America. At the end of 19th century it took a long time to order seeds and deliver to Germany. So I don`t think, that so many other companys copied Acme and sold to Europe. So there is a good chance, that Benary ordered originally seeds by Livingston. Also there are no descriptions for LYC 291 at IPK Gatersleben. So who will know, if LYC 291 is not the true Livingston's Acme? Having looked through dozens upon dozens of old seed catalogs from the late 19th-early 20th century, Acme was WILDLY popular. In fact, I don't recall a seed company in those days that didn't sell Acme. However as Carolyn has pointed out over and over in many threads here, there were seed companies in those days that would take tomato varieties and relabel them with a different name (think private label). Since you're in Germany, can you obtain some LYC 291 seed and grow it out? Acme was grown here in the States for 60+ years - up until the early 1940s. And someone, somewhere has got to have seeds for it. Last edited by stevenkh1; February 8, 2018 at 04:40 PM. Last edited by majabu; February 22, 2018 at 09:52 AM. Thanks go out to Maja who took the time to request, grow out and report the results for tomato accession number LYC 291. (https://translate.google.com/transla...%2F&edit-text=). Sadly, it looks like LCY 291 is the same or similar ribbed, red-fruited "Acme" that we have run across over the past couple of decades, and not Livingston's medium-sized (by today's standards), purple colored (pink fruited in modern terminology) tomato. Page 5 from the book, "Tomato Facts: The Story of the Evolution of the Tomato by Livingston's," The Livingston Seed Company, 1909. 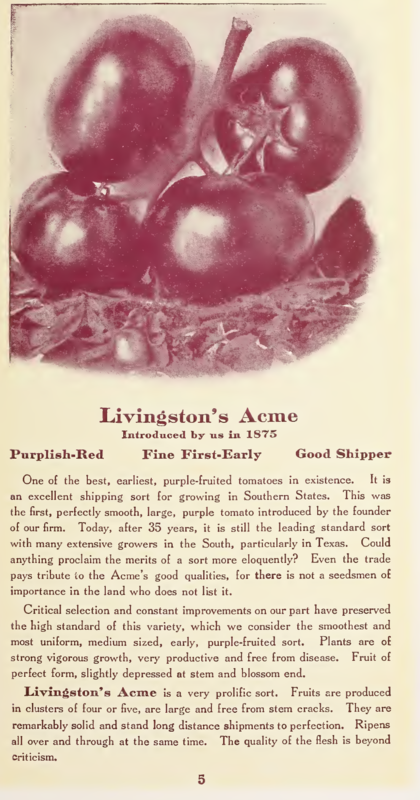 As noted previously in this thread, Livingston's Acme tomato appears to be extinct, at least in name and provenance. This beautiful cover shows many Livingston tomatoes. Acme is 8 down from the top. Purple (pink). Get all 13 packets for 50 cents. You can see other smithsonion seed catalog covers as well and also specifically search for tomato covers.